From the runways of New York to the showrooms of Milan and beyond, the decade of neon everything and sharp shoulders has found its way to today’s fashion circuit. 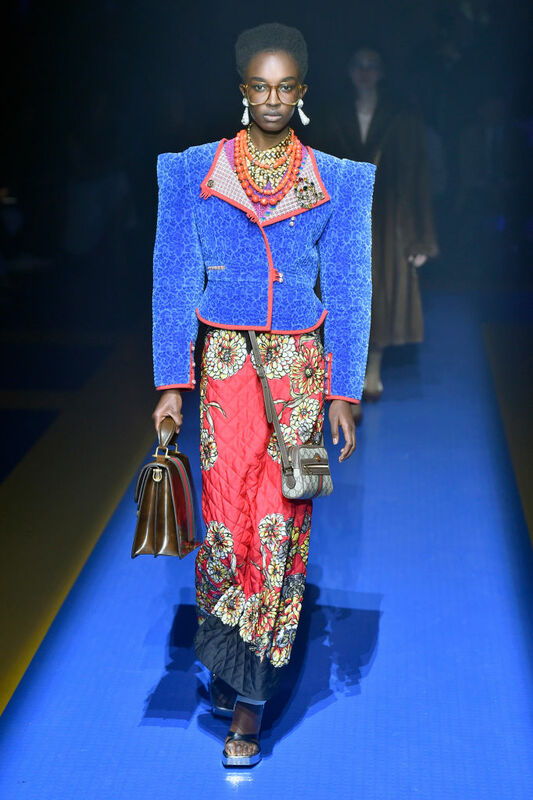 No stranger to playing small, Gucci took the lead when it came to finding inspiration in the ’80s, opting for sequins, shoulder pads, and metallics to prove its case. Even our girl Rihanna was inspired by the candy-colored brights and high-cuts of the decade. While we may be betting on millennial pink to stick around forever, we’d argue that an ’80s neon variation is making its own comeback. Although Milan Fashion Week is just starting, we could’t help but round up some of our favorite ’80s-inspired looks from the spring/summer 2018 runways. Gucci took the cake for their ’80s revival. 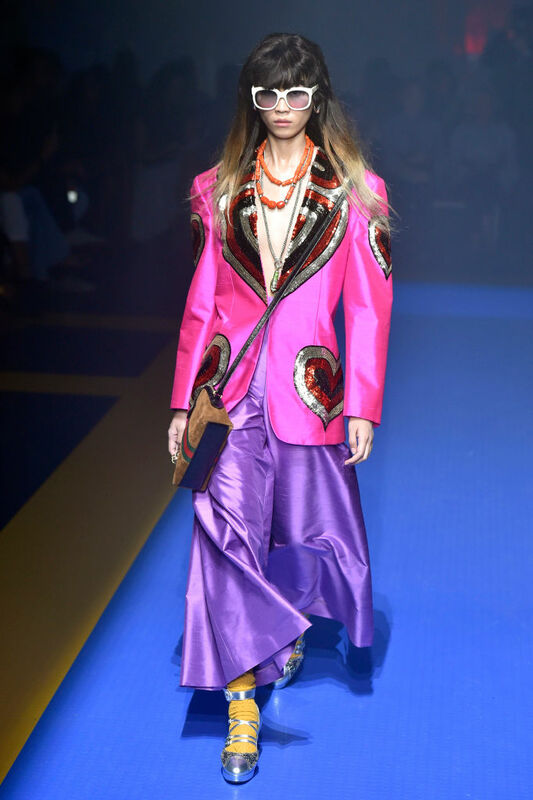 While there are plenty of designers inspired by the decade of kitsch and jazzercise, no one took their collection quite as far as Alessandro Michele, Gucci’s creative director. There were bold brights partnered with metallics and in-your-face prints. There was costume style jewelry and grandma glasses, and there were plenty of metallics and sequins. Another motif that helped Gucci stand out from the crowd? 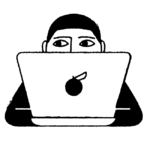 Its use of sharp, exaggerated shoulders. Many looks in the collection featured boxy blazers that were reminiscent of the popular style of the ’80s. But the classic silhouette of nipped waists and boxy shoulders got a chic upgrade thanks to some major embellishments like sequin heart patches and all-over velvet. Instead of leg warmers, we saw colorful socks playing peekaboo, which felt equally as fun. Add in some candy-colored silk staples and you have a millennial take on ’80s style. Lightning bolts, foiled finishes and fishnets all helped pack a kitschy punch with this collection as well. Bedazzled bodysuits even made an appearance, proving that fashion always cycles. Fashion East’s fuchsia fantasy also reimagines ’80s glam. Fashion East was another favorite when it came to ’80s style glam. 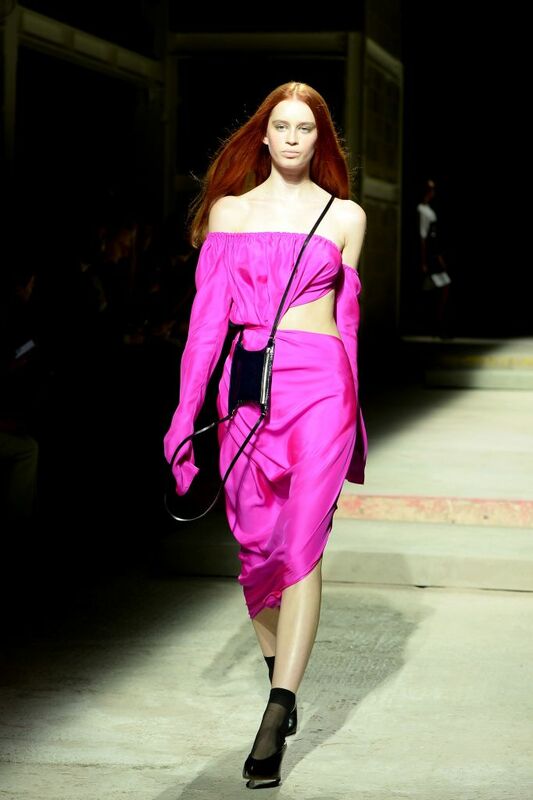 By reimagining the off-the-shoulder top and pencil skirt in a silky, bold fuchsia finish, this look brings the ’80s into the new millennium. Paired with a bag that could be a crossbody purse or a fanny pack, this ensemble also packs an element of surprise. Add in some sheer socks and black pumps, and this look is one to remember. J.W. 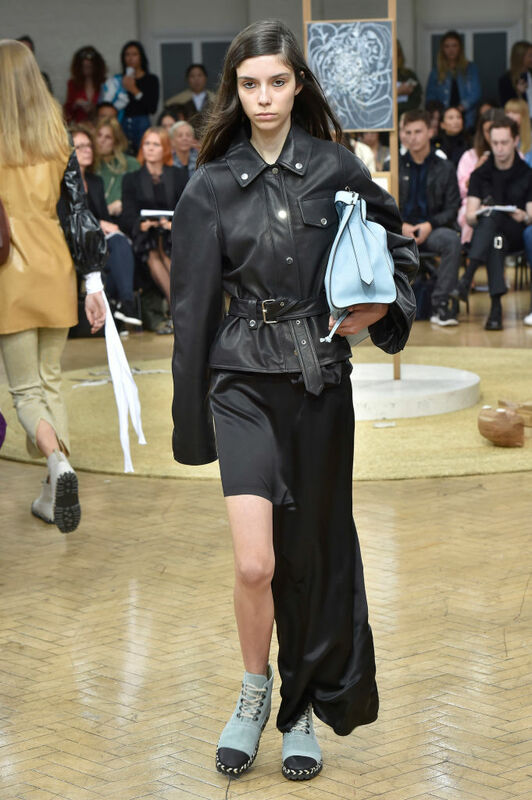 Anderson perfects the oversized leather jacket. Worn and beloved by nearly everyone, the leather jacket just has it. It has gone through many iterations through the decades, with one of the most notable being the boxy, oversized version that ’80s bad boys seemed to love. While many have tried to recreate this silhouette, this season, no one does it quite as well as J.W. Anderson, whose belted version helped land him on this list. With its rounded shoulders and “large but not too large” fit, this is a staple we would wear for decades to come. Fenty x Puma creates a DayGlo daydream. Off-the-shoulder was a classic ’80s statement-making silhouette, and we’re glad it’s still around. Of course, Fenty x Puma put its own twist on the style, adding corset-like lacing up the sleeves of the navy blue off-the-shoulder dress. The Pepto-Bismol pink accent with matching choker also helps cement this look as one of our favorites from fashion week thus far. Add in some mesmerizing lemon yellow slides and you’ve really got us hooked. The Blonds imagine a gilded kitschy fantasy. This look has it all: some incredible gold gilded boots, a ridiculously high-cut latex swimsuit, a classic ’80s style leather jacket, and a kitschy hair accessory that makes us want to lay on an island with a mojito. The Blonds’ latest collection was filled with head-turning pieces that were bedazzled to the nines. This over-the-top look is rocker-chic-meets-island-Barbie, and honesty, we’re inspired to lay on a private island for the rest of our days while wearing this.